In my last book review, I suggested I was already sold before starting reading the book. I should admit that this time I was feeling fairly negative at the same point. That’s partly because I’ve never been that keen on the author Martin Buckingham’s work on strengths, or Gallup’s Q12 measures of engagement, which I think often take organisations in the wrong direction, since they deliberately avoid defining engagement as a psychological state, which I think is fairly essential in taking action to improve it. In addition, Buckingham is, himself, responsible for one of the most popular debatable perspectives on management – that “people leave managers”. I call it a myth, or even an adage, as it’s become something that many people simply trot out without thinking about it – because if you do think about it, it’s clearly not always the case. And an increasing amount of research challenges it as well. Managers are important, but so to are organisations. A good manager in a well run company will create more engagement than a bad manager in the same organisation. But they’ll probably create more engagement than a good manager in a poor company too (‘lie’ #1: People care which company they work for – yes, of course they do). Note, however, that I don’t call Buckingham’s claim a lie. Buckingham states he chose this word for what he sees as erroneous beliefs because “they are pushed at us so hard, almost as if they’re being used to steer us away from the world as it truly is”. Well, for me, the prime example of this is “people leave managers” but I still don’t think the word lie is either appropriate, or useful, even for that. This is firstly because the world of work is complex, and different things work for different organisations and different people. Particularly as “there are some things that are real simply because we all agree they’re real”. Just because one set of data says one thing doesn’t necessarily mean something else is wrong. Eg Buckingham has his data from Gallup, his own company and more recently, ADP. And his co-author Ashley Goodall has his data from Cisco. But going back to my last book review, Tomas Chamorro-Premuzic reviews other research which directly opposes Buckingham and Goodall’s data on the importance of feedback, potential vs talent, cultural variability (vs ‘people leave managers’ / culture not being important), and the role of strengths. I could provide plenty more support for the nine supposed lies as well. Actually, there are often are ‘alternative facts’. But secondly, having different data saying different things certainly doesn’t indicate a malevolent intent. So, particularly in today’s world with all the accusations of lies between Trump and CNN, between leavers and remainers in the Brexit conflict, etc, I think we (educated and progressive practitioners in the future of work) need to be really careful about calling other people liars and ideas we don’t agree with lies. Putting all that aside, there are still a lot of things which irritate me about the book. But there are some real highlights too. Firstly, I really like the suggestions on the importance of both Me and We, which align with my own focus on both human and social capital. 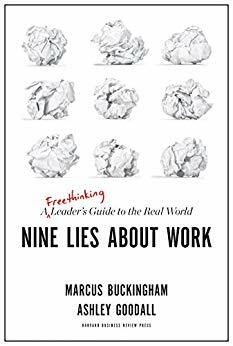 This is particularly important today as there is more focus on teams, and in fact Buckingham suggests that “In companies with over 150 employees, 82% of people work in teams and 72% work in more than one team”. However, it’s not clear whether these are real teams or simply functional groups. Eg Buckingham suggests the big thing about teams is that it allows people to express their individuality but I’d suggest you really need communities for this. A problem particularly associated with We is the impact of bias (lie #6: people can reliably rate other people). So I agree that we need to be careful about the idiosyncratic rater effect in performance management (in the same way that Buckingham’s book probably says more about him than the nine areas, and I guess this review says more about me.) However, I can’t understand the logic of asking managers what they would do rather than what they think about the person, since these actions will still be based on biased interpretations about the person. See my comments on the authors’ HBR article describing their performance management work at Deloitte and do let me know if I’m missing something here – I don’t think I am but I’m amazed this got into HBR if not. Another problem is that there’s often less good data available about We then Me. So I disagree with Buckingham about this too. Bad data isn’t as useful as good data but can still reduce the level of uncertainty about the decisions we need to make. Multiple feedback sources may still be biased but are still more useful than feedback from one individual. And validity is more important than reliability. We often have lots of reliable operational data but often this doesn’t provide valid measures of what we’re focusing on. Asking people what action they will take about their people is an example. So is assessing a leader based upon the followership within their team (eg this is likely to favour men vs women). And so is assuming that people being on at least 5 teams is a positive (they may be engaged by it, but as was pointed out in an HBR session recently they will not necessarily be good at it, and this is also a major cause of organisational over commitment). Actually, Buckingham himself makes this argument in connection with IQ and performance – it’s a reliable measure but isn’t a valid indication of career success. Moving on, I’m not against strengths or spikiness (lie #4: the best people are well-rounded) and agree excellence is often idiosyncratic. But a lot of organisational activities are very different to playing football for the Dallas Cowboys. Work is complex, more integrated and also often intangible so it’s not always possible to put someone in a role where their weaknesses don’t apply. It’s also interesting that whilst Buckingham promotes individual spikiness, he doesn’t seem to understand organisational spikiness, ie that spiky companies will appeal strongly to some people, hopefully the ones they’re targeting, and that a natural consequence of this is that they will turn some people off. So the fact that Bridgewater with its long list of principles sees a high turnover rate isn’t necessarily a problem (though they may need to improve the effectiveness of their selection activities). The above comments on complexity apply particularly strongly to leadership (lie #9: leadership is a thing). Exceptional leaders act in unique ways but most good leaders do a lot of similar things well, including paying attention to them and helping them use their strengths. So leaders do need fairly broad ranging skills – weaknesses can become a serious liability otherwise. I think Elon Musk, referred to in the book as a good example of spiky leadership, is really a great example of why breadth is important being someone with huge strengths, but also some fairly catastrophic weaknesses. But I do agree a lot of leadership development is rather rubbish. I also agree potential is a difficult aspect of people management, but it is also an important one so just because it is difficult does not mean we should ignore it. I do however suggest that potential should always be assessed formally, eg through an assessment centre, not left to managers’ subjective opinions. High potential programs should also include clear entrance and exit criteria and mechanisms. And they should be broad and flexible enough to avoid separation of hi-pos and low-pos, especially given the importance of We, eg see my suggestions on talent slicing. Buckingham notes that no one ever talks about potential and suggests ‘momentum’ instead. Trust me Marcus, nobody ever does or ever will talk about people momentum! (at least I really hope not). I’ve got more limited concerns about lie #2: best plans win and #3: the best companies cascade goals too but I’ve already gone on long enough. And I’ve already provided my comments on lie #5: people need feedback on one of the authors’ recent HBR articles. To conclude, and you may not be expecting me to write this, but you should read this book. It’s full of complete nonsense but the fundamental idea behind it, which is that we need to check our beliefs, and what data we have to support or challenge them, is absolutely sound, and is also really important to do. Agree or not, Buckingham’s nine points will help you do this. Just don’t call the things you disagree with lies.